Meat is animal tissue used as food. Most often is used to describe skeletal muscle and fat that is found with it. Types of meat include beef and veal from cattle, pork, ham and bacon from pigs, mutton from sheep, venison from deer and poultry from chickens, ducks and turkeys. The word meat is also used for sausages and for non-muscle organs which are used for food, for example liver, brain, and kidneys. Eggs may also be included. 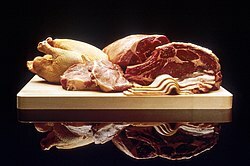 Meat is an important part of the diet of many people because it contains protein. Protein helps the growth and healing of a body and gives energy. Meat is a "high-protein" food, but costs more than other foods like bread and vegetables. People who cannot afford meat, or who do not like to eat it need to find other ways to get enough protein in their diet. Beans and certain nuts are also high in protein. People that choose not to eat meat are called vegetarians, and those who do not eat any animal product are known as vegans. Animals such as members of the cat family that mainly eat animals are called carnivores. Red meat is darker-coloured meat, different from white meat such as chicken or fish. Some raw meat can make humans sick. This page was last changed on 7 January 2014, at 08:39.